The key to an effective event registration form is to engage your potential participant from the off. The quicker you have their attention the more likely it is they will complete the registration form. Considering the fact more than 85% of the information our brain receives is visual, visual stimulation is one of the most powerful ways to improve conversion rates and event sales. Conservative spenders make up the large portion of almost every customer base. In the world of online marketing, enticing and encouraging the customer to make a purchase is best achieved through visual stimulus – calls to action and persuasive text, that use the persuasion, emotion, trust approach, to stimulate potential buyers into making a purchase. Two of the best examples for persuasive design are Amazon.com and Booking.com. Take the Today’s Deals section in Amazon. One of the main reasons it’s been hugely successful is the strategic use of the persuasion, emotion, trust approach. ‘Ends in…’ end of sale notifications and ‘… Claimed’ notifications, representing the number of people who have purchased an item from a flash sale, create respectively emotion – the fear of missing out; and persuasion – implying scarcity increases demand. Trust is inspired by allowing customers to add their own reviews of products they have purchased. Booking.com’s approach is highly successful as well. Most of the elements on their site are a combination of persuasion, emotion, and trust. Again they allow customers to write reviews and rate their experiences. They use a number of sales triggers conveying a sense of urgency such as: displaying of the number of people who are currently looking at a specific hotel (“22 other people looking now”); “Only 1 room left” and “In high demand” notifications when the number of available rooms is in short supply; “Today’s price: Expires in: x hours” and “Someone just booked this” notifications. The end result for both of these behemoth websites, is that their visitors end up making a decision more quickly and more confidently. To conform with all of these best practice marketing techniques, online ticketing and event registration software Weemss created the Conversion triggers feature. It allows you to create automated notifications on your registration form. They generate some buzz, improve the way your brand is perceived, and stimulate the potential participant into making a purchase. 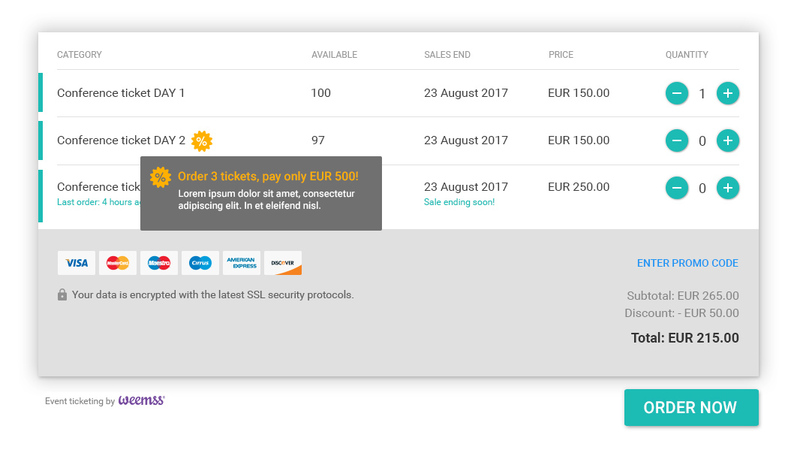 Display a notification about the number of remaining tickets available. By showing that your tickets are in limited supply you essentially increase the demand. This is always a strong persuasion element and is particularly effective when combined with a good Special offer. The fear of missing out is a common driver of action for marketers and advertisers. Marking the approaching end of the ticket sale on your registration form uses the element of emotion. Time running out creates urgency and leads to increased ticket sales. Provide social proof. Show the time since the most recent registration was made. Potential participants feel more at ease knowing that someone else has already registered for your event. It generates the element of trust and raises the chance the next person will register as well. These notifications update in real-time, according to the rules you have set. Their elements link directly to the potential participant’s confidence when making a purchase and re-enforces the feeling that they are making the right decision. Another very popular method for improving conversions is the crossed price. It is widely recognized that the visitor often responds to better value. Once again Amazon and Booking.com are a good reference on how this is utilized to great effect. They put the current price right next to the crossed out original price. This allows the potential buyer to easily compare the old price and the new price. In line with this, when creating your ticket categories, Weemss let’s you put an accent on your value propositions, by adding a crossed out price on your registration form for each category. Enticing customers to buy has been around for many years now and the techniques used have improved overtime. Creating your registration form with usability in mind, is not nearly enough to ensure high sales anymore. To stay ahead of the pack you need to consider persuasive design as a key factor in increasing your event revenue. The Conversion triggers is a great way to add such persuasive design elements to your registration form. Try the persuasion, emotion and trust approach to sell more tickets with Weemss, Sign up now!